The Gentleman Crafter: What? No Bronze Eyelets? Wow! This week has been unreal! I've been working late this week which gets me home around 7:30ish and I eat dinner while I craft. I've decided you can get the most amazing "distress stains" from hot sauce dropped onto Valentine tags! Must be something about the acid in the tomato that does it! Tonight I decided to blog while I eat so if you see anything on my teeth as I write this, let me know! Anyway, my goal for this year is to go back in between other projects and write patterns for past projects I did last year. Did you catch that? I barely did! I cannot tell you how honored I am to receive scads, well scads may be a bit strong...how about...a lot... of emails requesting these tutorials...So, I'm trying to attempt this task. Is task a good word? This week, I have been busy writing/making the 10 Things I Love About You Heart Box....Actually for this one it's more like 15 things....Hope to have it done by Friday....Next up is what I'm calling Leisa's Wine Box, formerly known as The Traveling Wine Box. Then and yes, sit down for this one...I'm actually going to pull out the pattern that was written but needed a major reno...The Lynn's Lighthouse. Probably, the one project that I get at least five emails a day asking for. LOL! My pleasure I say! Now that that's in writing, I hope I actually can do it! LOL! It's going to be a busy year! OK, can I vent for a second? Just a second and then you can get back to your fried chicken. Now you know it's going to be serious when I get out the Good Gravy On Biscuits Language! But, GOOD GRAVY ON GREEN BISCUITS GERTRUDE! Am I living in such a cave that I am the only one in this GREAT STATE of TEXAS that uses 3/16 eyelets? Really! How many stores do you need to go to to even find a single package....Yes, I looked in the leather and sewing depatments too! No, there's more....LOL! So, now the question is, WHY IN HELLATIONS can I just not buy a pack of 3/16 Bronze eyelets without having to... one, buy them online, two, buy them in a huge $14.99 JUMBO pack that just has 6 of the bronze colored ones in it! TELL ME! Bahahahaha! Here's what I was lucky enough to purchase tonight...350 pieces even! Y'all I have about 6 of these 350 piece babies just to get the 6 bronze eyelets! LOL! And yes, I know I should be more organized and purchase a boatload of the 3/16 bronze rarities just to have them on hand! If you see them...Grab them! Just wanted to jump on and say hello! Have an awesome night! Love your eyelet story and I know what you mean. Eyelets apparently are out style????? And we all thought we had enough eyelets. I too am a big user of the metal colored ones and never have enough. Guess what your followers will be doing the next few days......hitting the stores for eyelets. Look out! I am soooo excited to get my hands on your lighthouse tutorial! But get some rest in there too!!! Ow Jim, how I love your blog posts. You are hilarious! Good luck with the eyelets my friend lol. ahhh.. sorry about the eyelet situation! I need to look and see if we can hook you up :) can't wait to see the tutorials. I might have some when I was an embellishment hoarder. Hope you got enough. I was going to suggest alcohol ink but Ellie beat me to it. Yikes...I'd better check my eyelet collection...if I can find them...been trying to do some purging and reorganizing my studio...just in case I have company...LOL!!! I have to say I almost spit on my keyboard reading your post tonight...you make me laugh...and that's a GOOD thing!! Well if it makes you feel better I use to have to go a state over just to get to a craft store lol... However, the pack you got has some yummy goodies in it! Sorry Jim I was thinking of Steven when I mentioned the tornado. I too laughed reading your post tonight! wow.... that's a lot of pieces n' parts! 6 x 350... yikes! But the brads look really nice! We all know you will use them up before you know it because you'll get a brain storm of how to use all of them in a single, magnificent 3D creation! :) Here's a tip for writing up your projects... keep a note pad right beside your craft sheet and jot down what you use as you use it, measurements as you cut things, etc. It's what I do, but then again, I don't make huge altered art pieces either. Good gravy indeed! That is a lot of eyelets. Thank You so much for making a goal to write tutorials for us. Have a good evening. Jeez Louise, Jim! I'm still fighting the urge to buy every package of Tim Holtz feet I run across. Don't get me started on eyelets. Lol.Have you told your work that they take too much of your time? Don't they know who you are? I know, you've got to pay for the eyelets. Thanks for the delightful post! You are so funny... don't get me wrong I do understand your frustration. I'm one of those who will search all over for what I want.. and IF I have to search all over I will buy it up(I always have a fear that they are gonna stop making something I really like so I try to "Keep" it on hand) ... so that I don't have to search like that again ... LOL ! My friends and relatives laugh at my stash; but it is funny they'll come to me when they need something! That is a cool assortment you got there! You sent me on a mission, try rivetbuttonshop on etsy. I see 60 sets of 3/16 bronze in purse making hardware for a really good price even with shipping (and a ton of other options). Looks like purse making hardware. Good Gravy on Green Biscuits .. I think I'm going to have to use that .. LOL I can't wait for your tutorials, new to the blog but I love your work. How about one on the Eifel Tower you did for Tim ?? LOVED IT !!! Well, you should talk to Tim. He brought back the trailer hitch for ya...maybe he can do something about the eyelets, too. I get really frustrated when a supply I use all the time is deemed "out of style." Whose style? And, I am going to say Good Gravy on Green Biscuits Gertrude at least once a day from now on. You've certainly got some work ahead of you with all those tutorials! Good luck with your eyelet search, I well understand your frustration. I think every crafter has been through it with various products over the years. Jim...I checked eyeletoutlet.com for bronze eyelets and found them only as mix ins inside multi-packs. What a pip! That place has eyelets shaped like Martini Glasses but not simple bronze eyelets! Good luck on your quest. I am holding you to the wine box. If I had known all I needed to do was email you everyday I would have been on that like white on rice. LOL: You crack me up! Why don't you just use your bronze dabber and the color the others? Enjoy your weekend. Eyelets? I have a bunch of them, probably more than I will use in my lifetime. But! I don't use them anymore, in fact it's been so long since I've used them I think I've forgotten how to use them!!!! Jim, you crack me up, but I so understand about starting a project and then not having the one thing to finish it off with. Good Luck! Jim - your blog entries always put a smile on my face!!! Jim, Eyelets are pretty much out of style I think. There was a time when you could buy them everywhere. I probably have some in a stash some where. Why didn't you just call and ask??? FYI if you have another color eyelet, you can always heat them and dip them in bronze embossing powder and then heat them again. Another choice is to color your eyelets with a bronze sharpie. I have never had green biscuits, but good gravy on green biscuits I understand your plight. I have already been through the search for bronze eyelets. Now I own bronze gilders paste. I am looking forward to the wine box, I will definitely be purchasing that pattern. Thanks to BKAZOO for the heads up on the etsy shop. Hi Jim, Always love and read your post. I was wondering would a bronze colored rub and buff and q-tip also work to get the color you want. I am not experienced with rub and buff but just a thought, and at least you might get to use up your collection of eyelets. I know your pain you should try to buy stuff here in the UK, I've often had to buy Stateside and its so much cheaper also. Look forward to seeing the tutorials in the near future. LOL, love the southern jargon. Thanks so much for the update on the tutorials. I know you are super busy. I am sure you know that you can use alcohol inks to change the color of metals. Just heat set and you are good to go. It isn't exactly the same, but will do in a pinch. I have some extra bronze ones, want me to send them to you? Would be my pleasure. Oh, and in the package I can send an extra hour a day to aid in helping you get those tutorials completed. I can spare an hour a day for a week or so! I feel like a kid anticipating the much desired toy. I can't wait to get my hands on the most fabulous project ever directions, Lynn's Lighthouse. I am one of those pesky people wanting that tutorial! Sorry to be such a PITA. I have been in a crafting rut and this project so makes me want to create again. THANK YOU! Jim I love to read your posts. They make me smile and laugh. I am also sooo excited you are doing a tutorial for the Lighthouse. Jim: You always make me smile when I read your posts and your expressions! In NYC I can honestly say I haven't heard Good Gravy on Green biscuits Gertrude before! So fun and rather poetic! I hope you can find a stash of your eyelets for future projects. I have colored ones, silver but no cooper or anything close. Don't see them much in the stores here at all anymore. Looking forward to seeing your tutorials! Try using Guilder's Paste to color them whatever. It does work like a charm - thanks to Laura for finding it for us. I use it to color a huge variety of things and it does dry quickly and hold up! Now you can use the rest of your box of not bronze stuff. Jim, I feel your pain! I love to use them also and it is dickens to find them! If I come across any I will for sure drop you a line and tell you where! I also find myself digging through my embellishment stash when creating looking for something... even if I am not sure what it is to come up short! I think we should come up with a list of got embellishments that every crafter should have on hand, but where to start? LOL! I hope you have a wonderful day and hope to see your Valentine creation soon! Wow Jimbo, all I can say, is it is about time!!!!! So glad that you are planning to share the light house tutorial with us. I purchased all of the papers and such way back when just so I would be ready just incase you decided to do this. So glad I did. That is definitely my favorite piece of yours. If I may be so bold to put in one more request (and I know I am not the only one), since it kinda made you stand out at CHA, could you consider doing a tutorial on that fabulous eiffel tower that you did for Tim's booth? I know so many of us would just love to recreate it. Thank you for just being you. Your posts always make me laugh and I'm with you. Why is it that when you want something in particular, you can not just get in the car and drive to a craft store and pick it up???? No. . . . . instead, you have to get on the internet, spend valueable craft time searching and then there is the wait time for it to be shipped and let's not forget the added cost!!!! Yes I hear your fustration. I know it well. I think to be a really great crafter, you must master patience - definitely not my strong suit. Hello Jim- I wanted to send an email requesting tutorials-but-I thought you might get a thousand requests. How many tutorials can one GENIUS make? Eyelets-Out of style? Say it ain't so! I just bought a Crop-a Something to make it easy on me-I was told. Still in the package. Waiting to buy grommets. I looked for bronze and black eyelets/grommets. I put myself on a waiting list-LAST YEAR! 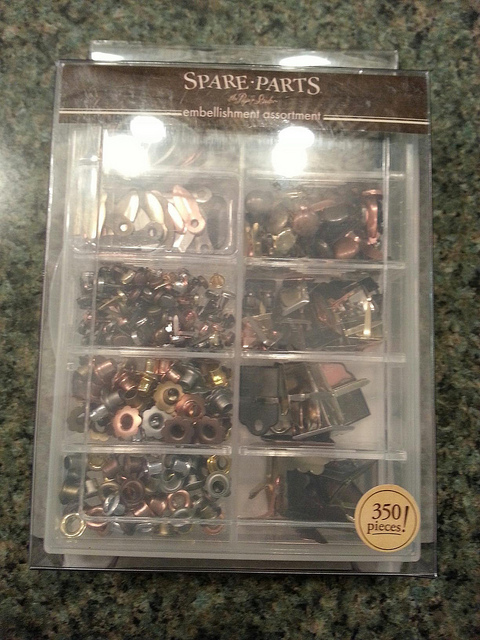 Still waiting.Quick question- Your package of "Spare Parts"- who makes this line of supplies? Watched your YouTube videos the other night- WOW! Take it easy on me-I'm still learning to cut chipboard. You are a fun-loving person. Even though my VISA will start shaking in my hand as I make yet, another craft purchase, you are worth every penny-truly. Thanks for sharing your talents. Blessings. Bring back the eyelet! Yes!!!! And good resolution about doing the patterns/tutorials! Not sure about green biscuits, even WITH gravy! Someone may have suggested this but, when it comes to the tutorials, you might try a voice activated recording device. That way you don't have to stop every few seconds to jot something down or turn the recorder off and on (although I'd rather do that than write each step... that's harder than DOING each step for me!) Snapping photos helps me, too. Never lose that southern way of talkin'... I don't care what anyone else says; we love it! Uhhh... looks like you have about a hundred suggestions for painting eyelettes. What I don't understand is how you didn't think of that... you are pullin' our collective leg, right? I CANNOT WAIT for more of your tutorials to come out. I got the most recent Monthly Idea Organizer and will look forward to more more more. You make my days. I cannot wait for your tutorials either. I sympathise re your search for suitable brads, I am having the same problem, but am travelling down to Sydney next wee so should be successful - keep up the great work and thanks for sharing!!!! Loved your post and boy did you hit the nail on the head or the eyelet! LOL Last month I searched & searched the web for the large size eyelets and found none also. It's like they've gone out of popularity so bye bye! BUT I keep seeing layouts, cards and altered items that are using them. Some people must have a stash of them. I even searched EBay to no avail. I forgot about the Spare Parts at HL, so maybe I'll check them out this weekend. I realize you are looking for just the bronze but I'll take whatever color they have and use alcohol inks to color them. Maybe one of the companies will start making them again. Jim, you just made my day with your biscuits and gravy language. i really needed it today. Thank you. BUT-this is a pretty fantastic collection of hardware.Hobby Lobby tomorrow and hoping my local one has them. I can always count on you to make me smile! Your just too funny!!! I'm so excited to hear that you will be doing a lighthouse tutorial, I can't wait. Thanks so much. Green biscuits? Is that like the nuclear biscuits my mom used to make, the ones you can throw against the wall and they leave a dent? Now she did make green lasagna once, it was supposed to be red but she forgot to put in the tomato sauce! Oh well, needless to say, my mom does not do so well when she decides to experiment with her cooking! Love you, you make me laugh!